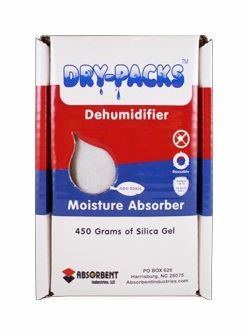 Measures 2" x 4-1/2" x 7"
Rechargeable silica gel dehumidifiers absorb moisture in enclosed areas preventing condensation and stopping rust, mildew, corrosion, and spoilage. 450 (1 lb.) Gram Silica Gel Unit protects up to 33 cubic feet of enclosed space. Ideal for safes, gun cabinets, large storage containers, and much more. Each unit has a built-in indicator that turns from blue to pink to signal it has reached its maximum moisture saturation level. Once that level has been reached, the unit can easily be recharged in any conventional oven. 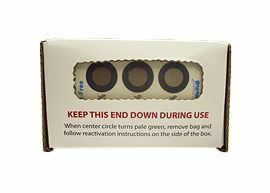 The units can be recharged as often as needed for lifetime protection. 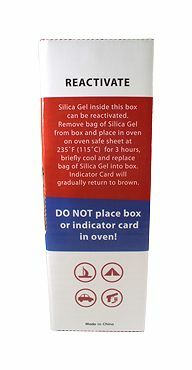 Silica gel is inert and non-toxic. Will not emit harmful vapors, stain, or cause chemical reaction. Safe to use with sensitive materials. The units are extremely effective at protecting your valuables such as family photos, documents, guns, electronics, jewelry, food, leather, coin and stamp collections, tools, collectibles, and much more. Measures 2" x 4-1/2" x 7".